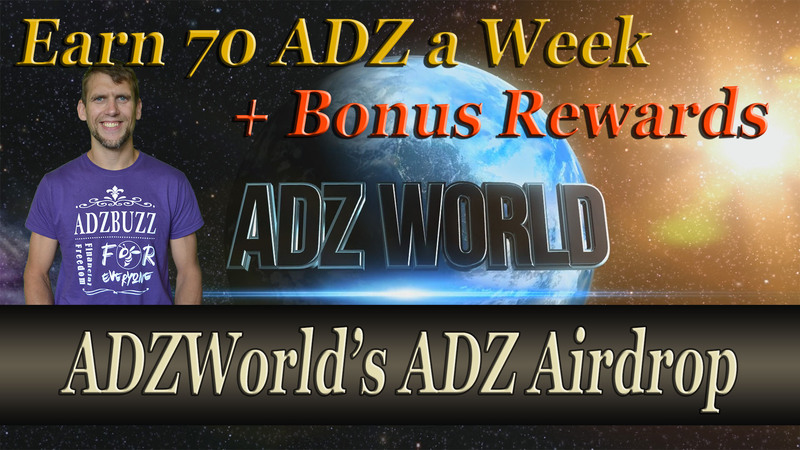 The next video in ADZ World's ADZ Airdrop: ADZ Airdrop – Earn up to 70 ADZ a week + bonus rewards Like and/or comment the video and earn up to 35 ADZ. After liking and commenting, don't forget to comment this post too as it is required to earn :) Go to this link and share that post to your social media and earn another 15 to 25 ADZ. You have to share the link of your share to this post to be qualified for the earnings. Go to the [original post]() to find out more. So you have a chance to earn up to 65 ADZ with this post :) Start sharing, liking and commenting! Don't forget to take part in ADZ World's ADZ Giveaway too where you can win more than 500 ADZ a week. Arthur Neguem on August 15 Y're right it's 60 ADZ. TheThunderthief on September 2 Fantastic idea!